The Endurance Lite is part of Craghoppers' Active range. It's an attractive looking, light-weight jacket using Craghoppers own Aquadry polyamide fabric. I'm female - a standard size 12 - and was wearing the female version of the Endurance. It fits well overall and is true to size including the sleeves which are a decent length. There's enough room to wear a thin mid-layer underneath it - which I've found necessary on a few of my outings during late March/early April. There are two zipped handwarmer pockets but regrettably no pocket big enough for an OS map. There's also a basic integral hood which can be adjusted by a tab plus drawcord. The freedom of movement in the shoulder area is pretty good - although this short-cut style does ride up when you lift up your arms. The cuffs are adjustable via a velcro fastening - which gives a little flexibility with temperature control. Rather disappointingly, though, I've found that the velcro is coming away on one of these tabs after a relatively short period of time. So far I've worn it for some Cheshire walking in moderate wind and intermittent but reasonably heavy rain showers. It's kept out both the wind and rain and the breathability has been perfectly acceptable. It comes with a neat little stuff-sac which has a mesh top which allows a wet jacket to dry out. For high level/mountain walking or for trips in prolonged rain, you should consider making a greater investment in a longer length jacket based on a 3 layer construction which will be more durable and breathable. 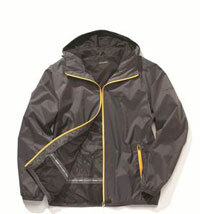 However, Craghoppers' Endurance Lite is an attractive looking, combination waterproof jacket. Great for general leisure/travel, it's also something to have at the bottom of your summer/spring daypack in case of showers.